We proudly recommend kitchen sinks from Kohler, Wisconsin! When it comes to materials, enameled cast iron remains popular for its beauty, strength and durability. KOHLER enameled cast iron sinks are guaranteed not to chip, crack or burn—they’re available in an expanded range of color, pattern and shape options. To complement modern kitchens, Vault™ stainless steel sinks are crafted from durable 18-guage stainless steel and create a look that cleverly straddles traditional apron-front and contemporary designs. The Whitehaven, Vault and Strive apron-front sinks feature Self-Trimming® edges, a unique design element that eliminates the need for precision cuts and the chance for unsightly gaps by concealing the rough cuts made into your cabinetry. So you’ll get the seamless, finished look you want with a fraction of the work. Come visit our showroom floor located at 1840 S. Highway 92 in Sierra Vista, Arizona or give us a call at (520) 459-3164. When it comes to investing in a kitchen, you want pieces that will stand the test of time everytime. Kohler enameled cast iron sinks have the strength to withstand whatever you can dish out! Nothing holds up in your home like cast iron because nothing is made like cast iron. Their ultra thick enamel finish creates a protective smooth surface that’s even more reassuring to the touch when you know that our lifetime limited warranty guarantees it will not chip or crack. Made super strong. You know it will last for generations. Sierra Remodeling installs Kohler enameled cast iron pieces in your house and, we consider it a home. Designer Drew McGukin reveals the inspiration and design philosophy behind “Metro Swivel,” the kitchen he created in collaboration with Kohler, Benjamin Moore and Silestone. Get a behind-the-scenes look at this contemporary live/work studio kitchen. Here’s a great example of the Neoroc™ Kitchen Sink in a well designed small studio apartment. KOHLER Neoroc™ composite is durable and built to withstand day-to-day cleaning tasks. KOHLER Neoroc®, a matte-finish composite material designed for extreme durability and unmatched beauty. Richly colored to complement any countertop, Neoroc resists scratches, stains, and fading and is highly heat- and impact-resistant. KOHLER Neoroc® composite is durable and built to withstand day-to-day cleaning tasks. Matte finish offers rich, dimensional color. Solid color throughout the sink. Heat resistant up to 750 degrees F.
Scratch, stain, chip, and thermal-shock resistant. Whether you’re investing in a simple Sierra Remodeling kitchen refresh or a complete remodel, it’s easy to bring the popular design of an apron-front sink into your home. Blending iconic design with seamless installation, apron-front, or farmhouse, sinks are sure to impress you and your guests. Plus, with the many installation options, it’s easier than ever to bring this look home. Apron front sinks come in a variety of sizes, shapes and installation types. With both top- and under-mount installations and two apron heights, there are versions that let you keep your countertops, your cabinets and others that are ideal for a kitchen remodel. If you’re looking to add great functionality, easy accessibility and sleek design to your existing kitchen rather than remodel, there’s the vault top-mount apron-front sink. Its unique shape allows you to keep your cabinets and countertops and requires only a few rough cuts for installation. The ultra-flat rim makes it easy to wipe from the countertop directly into the sink and the stainless steel front adds and instant level of sophistication to any kitchen décor. The short apron model, available in Whitehaven® and Vault, has roughly a seven-inch apron height that allows you to keep your cabinetry intact while still giving your kitchen and entirely new look and feel. Though the apron is short, the sink still offers the exceptional nine-inch depth you’ll want for cleaning large cookware. You can update your look further with new hardware or by giving your cabinets a fresh coat of paint. If your kitchen is already fitted for a tall apron or you’re looking to do a more comprehensive project, consider the Whitehaven® enameled cast iron sink or the Strive™ stainless steel sink. With nearly nine-inch tall apron fronts, these sinks make a stunning statement. 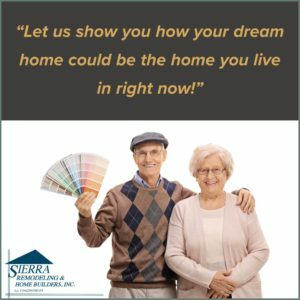 No matter which look you choose, either one is the ideal addition when you’re looking for Sierra Remodeling to replace cabinets and countertops in your space. Learn more about our Kohler kitchen sinks! Come visit our showroom floor located at 1840 S. Highway 92 in Sierra Vista, Arizona or give us a call at (520) 459-3164. Thank you for the excellent work you have performed on re-constructing my burned out house. The caliber of work is superior and the house is better than it ever was. I am very pleased with the final results. It was always a pleasure to work with the staff at your company. As the contractor Scott Miller saw that every detail was worked out. His partner, Jeremy, was personable and very easy to work with. I can’t remember all the people who worked on the house but please extend my thanks for a job well done to Mary, Poncho, Steve, Debra, and all the others. Thank you for e-mailing the warranty information and for the invoice. Payment is enclosed. Feel free to contact me if there are any other papers or other loose ends that need to be completed. Wishing your company every success in the future.